i woke up this morning and tried not to dread the beginning of the week like i usually do, but instead, to think of it as a fresh new canvas. sometimes i go through the occasional sunday slump... and last night was definitely one of those times. you are exhausted from the weekend & not ready to wake up at the crack of dawn the following morning. i don't know if i am the only one who has diagnosed my sundays to the slumps, but the combination of being sleepy + stressed doesn't do the best things for me! i have really learned that it's all about your thoughts, how you decide to positively view the upcoming week, and to find healthy ways to release your stress & anxiety. my friend, molly, just recently introduced me to yoga... i have gone here and there, but i have never truly committed to the form of exercise. not only does it make my body feel so amazing and flexible, it does wonders to my mind. i have become addicted to the physical and mental outcomes of yoga. 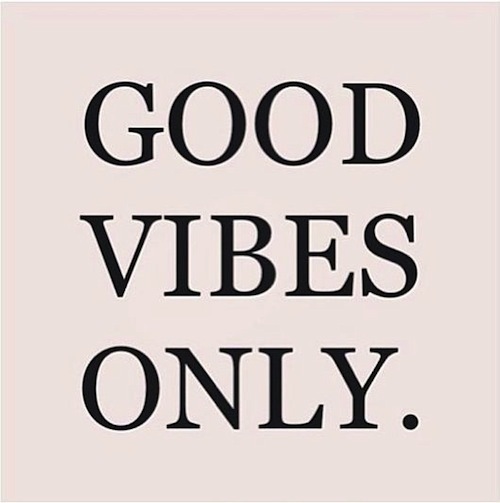 think good vibes only y'all. what are your guys' ways to deal with your slumpy situations? i am always looking for new ways to clear my head and try to be the most happy during times of confusion so holla if you have any go-to's!